Traveling History Kits, developed by the Deerfield Teachers' Center, are available for loan to schools and educators. These multi-media kits are filled with primary and secondary source materials and reproduction artifacts. Engaging activities are geared toward developing logical thinking and analytical skills. Guided by curriculum and Massachusetts Frameworks, the kits integrate the study of local history with language and visual arts, science and technology. This kit introduces students and teachers to the 1704 Raid on Deerfield, Massachusetts, through the eyes of two children captured during the raid and taken to Canada. The activities in this kit are designed to foster exploration and discussion and help students in grades 3-12 explore this critical event from different perspectives. Students will gain knowledge about the 1704 English, French, and 2 Northeast Woodland cultures. Lessons include an examination of the book, The Boy Captive of Old Deerfield, comparisons of food, clothing, shelter and cultures, deciphering primary sources, mapping, “The Mathematics of 18th C. Travel”, exploring a probate inventory and more. Items include clothing, toys, color pictures, The Boy Captive of Old Deerfield, and more. What defines an 18th C. gentle person vs. a common person? By examining an 18th century traveling man’s possessions, students also discover some of the purposes of a tavern. The main themes include money, the postal system, behavior, and taverns. This kit includes a list of suggested activities, background information about the major themes, primary sources including excerpts from a travel journal and “Rules of Civility”, and a haversack of reproduction touch-its. 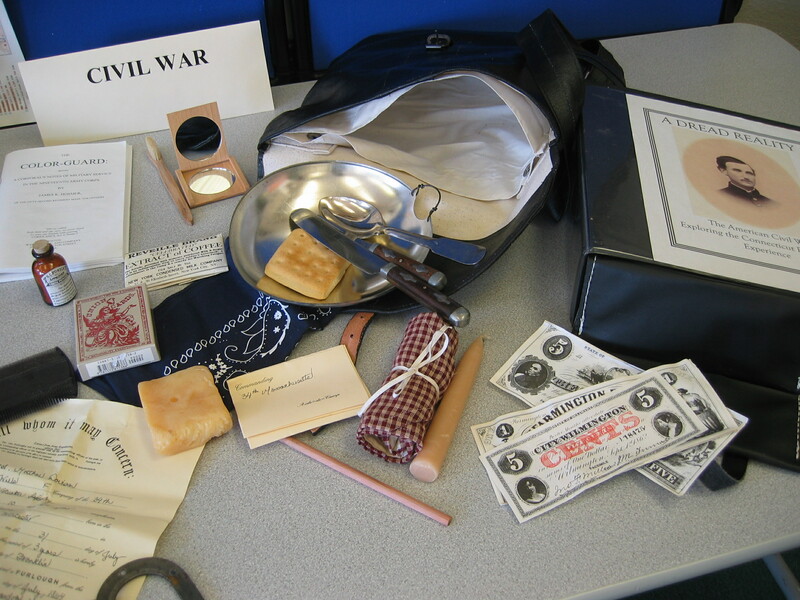 This kit introduces students and teachers to the local impact of the Civil War. The lessons include examining primary sources to find out more about the experiences of 3 different soldiers (including information about a soldier who fought in one of the Black regiments from Massachusetts), the work of Sanitary Commission volunteers, and the life of a young girl in Atlanta during the Atlanta Campaign. The lessons also include a mapping activity, a look at songs from the period, and an activity for younger children to sort the jumbled belongings of a Sanitary Commission worker and a soldier. Kit items include excerpts from the diary of a Deerfield soldier, a reproduction military map and reproduction touch-its typical of what a Sanitary Commission worker might have needed and the contents of a soldier’s haversack. This kit will help teachers and their students see how families in Franklin County, Massachusetts, were involved in supporting the war, and they will understand the effects that World War II had on civilians. Students will understand that many people, including children, worked together in a variety of ways to support their soldiers and keep us safe. Included in the kit are lessons, primary and secondary sources, images, and reproductions of artifacts.
" Everybody was a Pole"
This kit is designed to allow students and teachers to investigate the nature of Eastern European immigration to this area on many levels. Kit materials and activities are grounded by the fictional story of Kaitlyn Jeronski, a modern-day 4th grader, who is discovering her own heritage. Included are elementary, middle and high school readings and activities, scholarly essays and historical documents, and a basket filled with hands-on items. Activities include “Creating an Immigration Story”, writing letters to fictional relatives in America, writing journal entries, deciding what to bring, answering questions from a sample manifest, and examining a local newspaper for examples of racism and ethnic stereotyping. The Pilgrim History Kit is a collection of models, reproduction artifacts, children’s literature, and teacher resource guides. A hand-crafted Pilgrim house, ink and quill pen, and table top ninepins are just a few of the manipulatives that transport students to an earlier era in American history. Guides and books are grounded in primary source materials, affording participants a quality hands-on study of the life of the Pilgrims during the 1600’s. Combined with a guide book referencing such topics as foodways, geography, clothing, and home, the Pilgrim History Kit is appropriate for students Pre-K through upper elementary grades, and will help educators focus their topic of study in a structured manner, while aligning to the Massachusetts Curriculum Frameworks. Through this kit students can examine the colonists’ reaction to taxes imposed upon the colonies by Great Britain prior to the Revolutionary War, learn what was imported and exported to and from the colonies, learn the value of the American tea ceremony, and “take tea” in the classroom. Lessons include figuring tax amounts, creating political cartoons or poems, holding a debate and dividing reproduction items into piles of imports and exports. 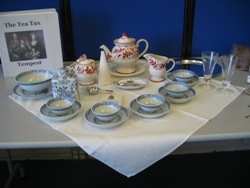 Kit items include a tea set large enough for a class of 24 to “take tea,” and reproductions of samples of imports and exports. Who needed to know what kinds of math in the 18th and 19th centuries? Students will explore this question through a wide variety of hands-on lessons that range from using the Golden Ratio, to figuring out 18th century sales taxes, to doing map work and comparing rates of travel. Examine the world and history of pirates and explorers of the Caribbean through a multi-disciplinary approach. Lessons include mapping, a math activity involving the division of treasure, a hands-on comparison of imports, exports, and the Triangle Trade, a comparison of films about pirates and explorers to actual history, sleuthing a myth about Captain Kidd, and more. As part of its mission to provide engaging and educational experiences for students studying history, the Pocumtuck Valley Memorial Association provides Traveling History Kits for educators to use in their classrooms. Kits will be available at a non-refundable rental fee of $35.00.This fee covers maintenance and replacement of kit items damaged through incidental wear and tear. Separate charges apply to items damaged beyond reasonable use, lost items, etc. Borrowers accept financial responsibility for all items loaned to their care. Kits may be borrowed for two week loan periods. A one-time, one week renewal is allowed upon submission of an additional $10.00. In the event that another teacher in the building wishes to use the kit during the same loan period, the kit and its contents remain the responsibility of the original borrower. If another teacher wishes to use the kit immediately following the original loan period, the kit must first be returned by the original borrower to the Teachers' Center for inventory and check in. Kits may be checked out by appointment during regular Teachers' Center hours. No more than two kits may be borrowed by the same individual at any one time. Each kit will undergo a complete inventory upon checkout by Teachers' Center staff with borrower present. To ensure that a kit is in loanable condition, loan requests need to be made a minimum of one week in advance of check-out. Call or email the Teachers' Center to check on availability and to request a kit: 413-774-7476, ext. 280. Kits may be checked in by appointment during regular Teachers' Center hours. Teachers' Center staff will inventory the kit upon check-in with the borrower present. Please be prompt in returning the kit, as others may be waiting to borrow it. Kits returned after the due date without prior approval from Teachers' Center staff will be subject to late fines of $1.00 per day to be paid by borrower upon final inventory and return. Please Note: some kits contain perishable items. The Teachers' Center can provide these items or provide a list of items to purchase as the borrower prefers. Unused perishable items do not need to be returned. Borrower must provide at least 48 hours notice of their intent to cancel the kit loan, except in the event of extenuating circumstances. (illness, school cancellation, etc.) This is a courtesy to other educators who may be waiting to check out the kit. Do keep kit items stored in kit container when not in use. Do keep the kit in an upright position. Don't stack additional items of any kind on the kit container; don't stand or sit on the container. Don't attempt to clean soiled items or to repair damaged items. Do leave a note in the event an item is soiled or damaged: "X got torn; X bottle broke," etc. and address the note to the attention of the Teachers' Center staff.